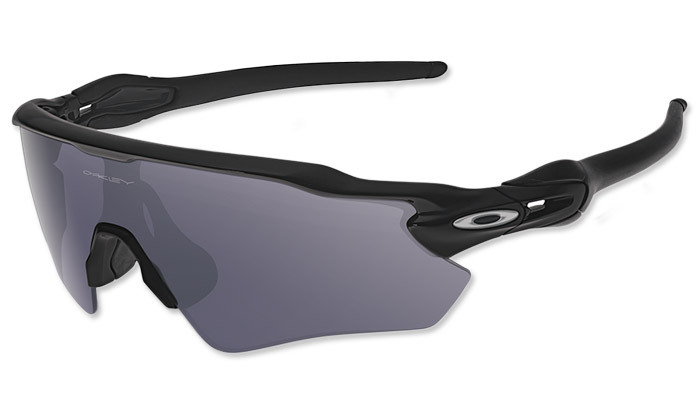 Oakley original Radar® eyewear in EV version with taller lens, Path lens shape and extended range of view in the upper peripheral region. Pure Plutonite® lens material filters out 100% of all UV, and Radar® meets ANSI Z87.1 standards for impact protection. High Definition Optics® provides visual clarity and patented Polaric Ellipsoid™ geometry extends razor-sharp vision all the way to the lens periphery. The lightweight frame of stress-resistant O Matter™ maintains a comfortable Three-Point Fit with the sure grip of Unobtainium® components while channeling air to keep you cool. Set includes protective Oakley Soft Vault with capacity for an extra lens, microfiber pouch for carrying glasses and cleaning lenses and spare nosepiece.